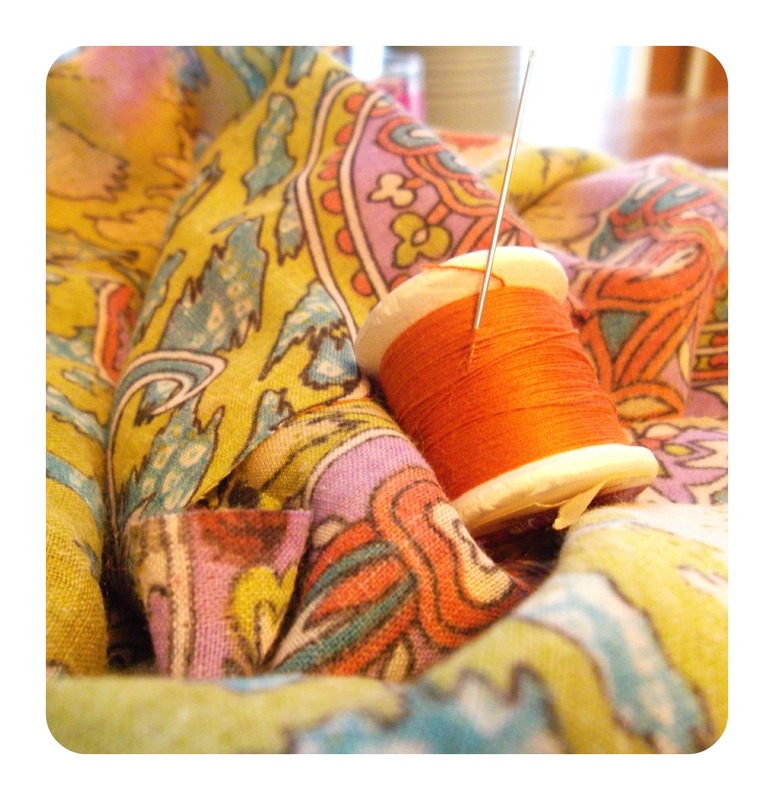 Foxburrow Vintage: DIY : 1 Yard Circle Scarf! 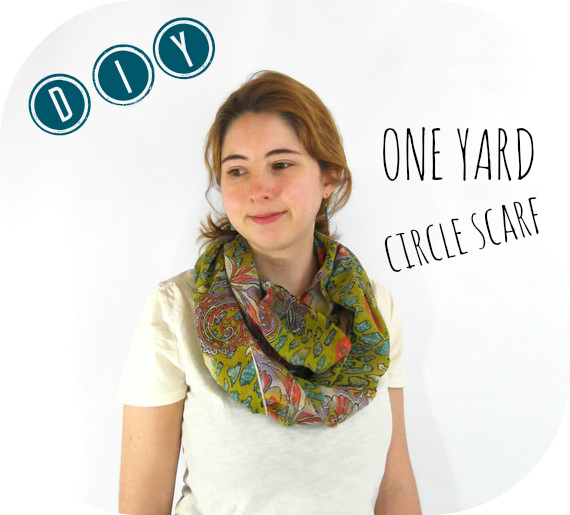 DIY : 1 Yard Circle Scarf! About a year ago I bought a pretty stack of fabrics that I fully intended to make lovely circle scarves out of. I started and made one, but the cotton was very thick and it didn't turn out like I had hoped. Most of the other fabrics I bought were lighter and gauzier or silkier than the first. Today, I'm all cooped up in the house by an unexpected (so far!) 8 to 9 inches of snow. They forecasted some some yesterday, but none that I knew of for today! I woke up early, and, in the mood to get some of my crafty craft side going, I decided to tackle making one of these circle scarves, and I thought you might like to tag along. I started out with a pretty, summery gauzy cotton. Gauze is a light weight, loosely woven and semi-sheer fabric that is perfect for summery accessories and garments. You can find a gauze type fabric at your local Jo-Ann Fabrics in the apparel fabric section, or by searching cotton gauze on Etsy. For a beginner, I don't recommend using anything silky, as it is harder to sew with. You'll also need some mercerized cotton or polyester thread and a sewing machine with a fine/small needle, a pair of pinking shears, and some sewing pins. 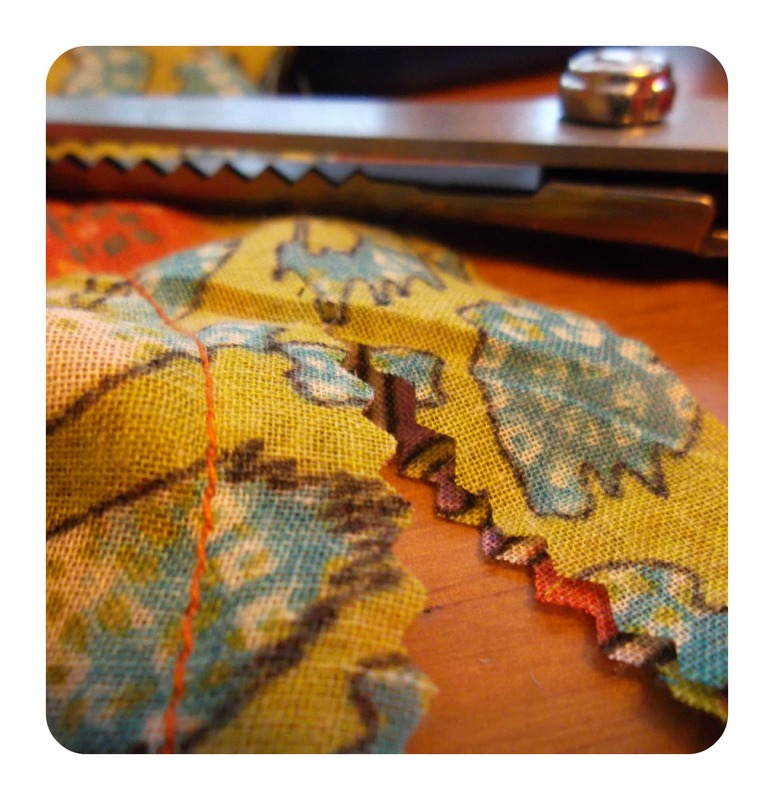 Pinking shears help prevent the fabric from fraying, which is especially useful for more delicate fabrics. Jersey fabrics roll in on themselves, so pinking shears aren't necessary for jersey, but other fabrics should be pinked if possible! Now you will have a very long strip of fabric. There will be one side that is selvedge (the edge that is already pre-finished for you) and one side that is unfinished. Now, if your selvedge has a copyright or name on it, and not just the fabric printed to the edge, you will need to fold over and finish both sides of the scarf. Fold over the sides you need to finish and simply sew with about a quarter inch seam allowance. If you notice your fabric is prone to fraying, you may want to pink the edge before you sew it, or double-roll it before sewing so that you don't end up with lots of little strings hanging from your scarf! After that's finished, all there is is to join up the two ends and sew them together just like you did for the first set of ends. Make sure you don't twist the fabric, and you are still sewing on the wrong side/same side as your other seam! Pink the edges on that seam as well. Now, you are finished! You have a lovely circle scarf that you can match up with some of your favorite garments! THere are so many possibilities with this scarf! I need one now! !